Style L oilers are used extensively on motors and small machinery requiring side oiling and extremely low cost. 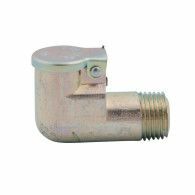 Zinc plated, 1-piece die-casting, has flat wrench hold on most Style L screw-type oilers. Also available in drive-in models.